Terence Crawford-Mikey Garcia: suddenly the hottest fight that can be made at 140? Just after his hugely impressive, even scary KO win over a previously unbeaten Dejan Zlaticanin, Mike Garcia spoke about the possibility of moving up to 140 pounds, in search of a fourth world title in as many weights. Garcia, who has everyone in boxing excited like never before during his career at age 29, has won belts at 126, 130 and, with the annihilation of Zlaticanin, 135. 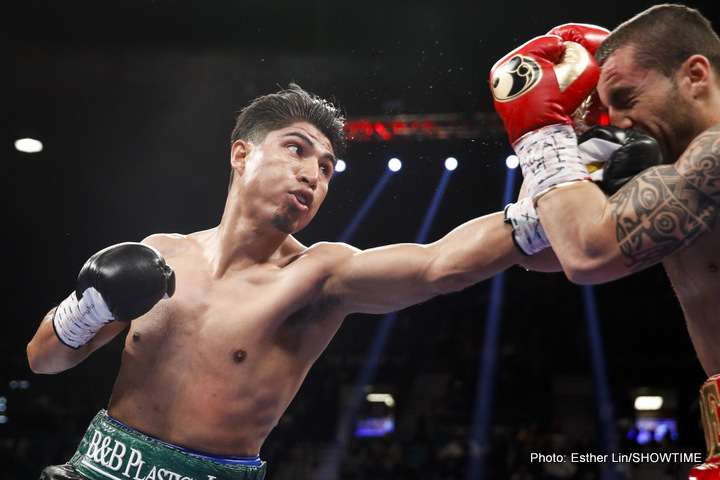 One man is ready and willing to face him – in a rematch – if Garcia does climb up to super-lightweight. Who? Terence Crawford. This is a great fight from all angles: one of the pound-for-pound best against another undefeated star; speed Vs speed, skill Vs. power. And Crawford’s trainer/co-manager Brian McIntyre, in speaking with RingTV.com, said his fighter is ready, willing and able to greet Garcia in his 140 pound debut should he come up. What’s more, these two have a history, having met years ago as young amateur fighters. Garcia has other big-fight options at 135, and the 36-0(30) star did say after vaporising Zlaticanin that he is interested in unifying the titles at lightweight. But there really is a buzz about a potential Garcia challenge of the 30-0(21) Crawford. Fans are raving over Crawford’s incredible skills and they are eager to see them tested to the absolute limit. Is Garcia the man for the job? Certainly Garcia has been able to carry his speed, sharpness and punching power up the weights with him, and there is no real reason to believe 140 and a rumble with Crawford would be a jump too far. If it’s promoted right, Crawford-Garcia could be a monster fight for the summer of 2017. Who wins? That’s a tough one, but two things are for certain: Crawford has a far, far harder time than he did last time out when he destroyed a game but outclassed John Molina Junior, and this one would be a great fight. Next boxing news: Gerald Washington on Wilder shot: I’ll shock the world! You are here: Home / Boxing News / Terence Crawford-Mikey Garcia: suddenly the hottest fight that can be made at 140?